She couldn't hold all those fruits and nuts by herself. 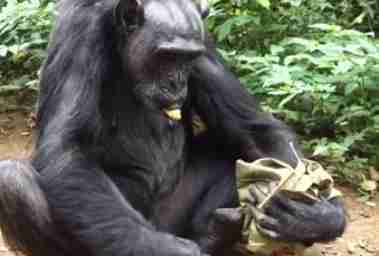 An elderly chimp named Bouboule spent 30 years in a city zoo before she was rescued and brought to a sanctuary. This was back in 2003. And ever since Bouboule has amazed her human caretakers by how smart, quirky and sweet she is. 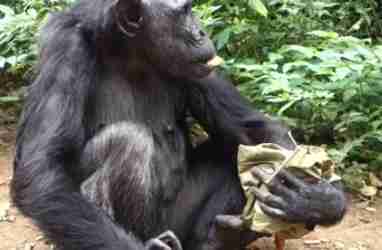 For instance, after her rescue, Bouboule adopted four baby chimps who came to the sanctuary and helped raise them into healthy adults, who still live with her at Sanaga-Yong Chimpanzee Rescue Center in Cameroon. When the 71 other chimpanzees at the sanctuary go inside their little houses to sleep at night, Bouboule prefers sleeping under the stars. In the morning, she emerges from the forest for breakfast. On one recent morning, Bouboule didn't come out for breakfast, preferring to stay in the trees. By the time it was late morning, she was very hungry. 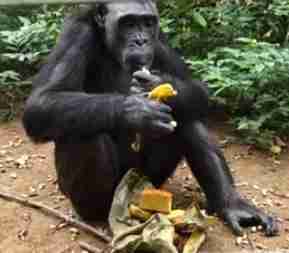 "When she showed up for the 11:00 snack of peanuts, [the caretakers] had a lot of food to give her," In Defense of Animals Africa (IDA) wrote this week. "She clearly wanted to carry her bounty of fruits and nuts back to the forest to savor, as she sometimes chooses to do with her food, but this day it was too much for her hands to carry." Naturally Bouboule was determined to have her cake, so to speak, and eat it too. 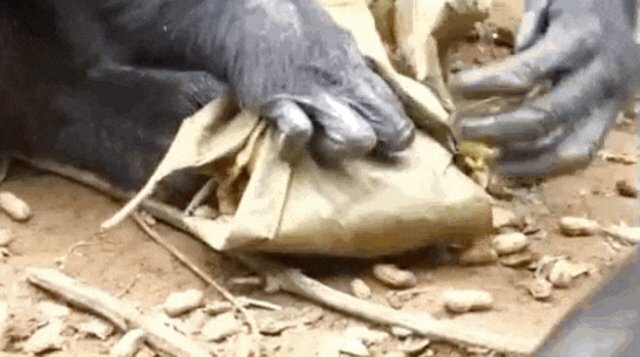 A video shows how Bouboule tried to solve the problem: by making a purse from a dried leaf. She folded up her snacks and tried holding it together with her hand and her foot. But her bounty was a bit too big, so she sat there a moment, trying to figure out what to do. "Caregiver Gomdong Julien's voice can be heard telling Bouboule in French to eat where she is because her purse is torn," IDA wrote in the caption to the video, "and then explaining Bouboule's behavior to a volunteer. 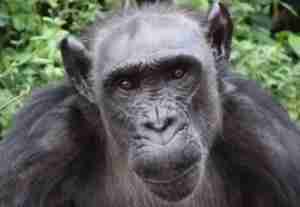 He's very proud of the chimpanzees when they do something smart or kind, as they often do." 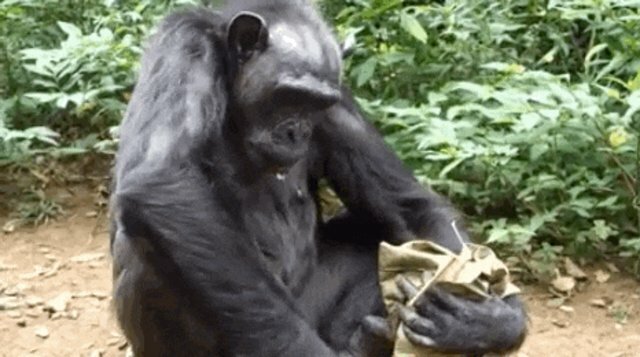 Finally, Bouboule decided that eating in the company of her caregiver was just as pleasant as eating in the forest - so she opened her little purse and happily had lunch right there. 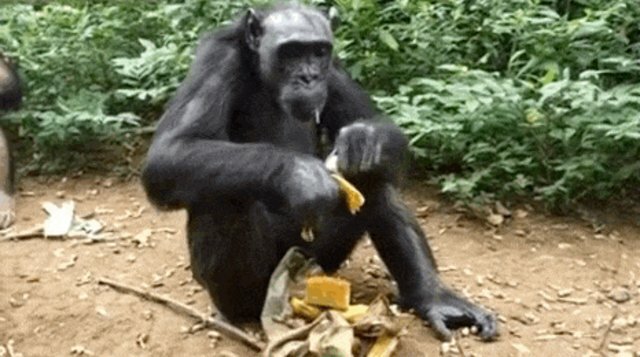 Click here to donate to Bouboule's endless peanut and banana supply - and to support all the rescued chimps at the sanctuary.